Christy from Tales of the Ravenous Reader & I loved Geekerella by Ashley Poston so much that we decided to fangirl over it together! Geekerella is a geeky reimagining of Cinderella. How well does it hit it off for the geek and Cinderella elements? K: I think this may be the geekiest book I have ever read & LOVED that aspect! But mixing that sci-fi nerdiness into the Cinderella universe was just adorable…glass slipper and all! CJ: This book is getting sooo much geeky hype so I was totally skeptical about it. Plus, aren’t we all burnt out of retellings? Let me tell you: The hype is real AND it’s such a perfect contemporary geeky retelling. I loved Stranger Than Fanfiction and The Geek’s Guide to Unrequited Love…This is totally in the same vein. In Cinderella, there’s a “normal” girl who becomes a princess and her swoonworthy prince charming. What are Elle and Darian like compared to their fairytale counterparts? 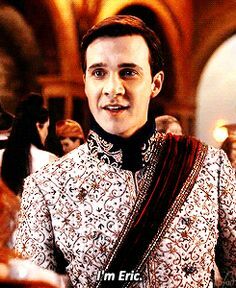 K: I would say that Dorian isn’t really like the prince charming in Cinderella, but more of a persona that he has to be to be famous when underneath he is just a giant geek and wants to be a normal teenager, and not stalked by the paparazzi. Where as Elle is being trampled upon her mean stepsisters and whacky stepmonster and felt much more like her fairytale counterpart but way funnier! CJ: Inspired by and so much better! Darien gets depth and a backstory that makes him even more swoonworthy (fanboy!) and Elle is so much more than the abused girl in Cinderella. Plus their friends and the characters around them are fun, too. So we’ve established that these two met via the internet. Talk about your experiences meeting people on the internet. K: Almost all of the people I am close with these days, I have met online, mostly in my own geeky community full of book nerds. I also started my relationship with my partner online, and was totally scared to met her in person, because in my day meeting people from the internet was scary, so I dragged my bestie along with me to a very populated bar. I can’t imagine my life without the relationships I have solidified online, because sometimes we need to find our squad, and they just might not be close by! CJ: Well, I mean, I met Kelly on bookternet so it must not be working out too badly. 😉 Actually, I’ve met some of my best friends on the internet. My husband and I connected over the internet and met at a concert. So meeting people on the internet has been a super positive experience. Highly recommend. But is the stepmother really evil? What about the stepsisters? K: I wanted to throat punch the stepmom, but not eeevil. More like idiotic and cruel. She’s trying to live above her means, while appearances and class are all that matters to her, and those are the things I eschew in my life. The stepsisters are a product of their mother, but I think you will like where the story takes them both. CJ: She’s really awful. Evil is a stretch but she’s a selfish, grieving widow that is taking her feelings out on her stepdaughter. The twins are similar but get a different story in this book. I won’t say more than that! What are some of your favorite quotes? What unique aspects of the story did you love? K: I love how the book shows how much of a community one can find online with others whom love what you do. You are not alone, if you ship something, so do a thousand others, and you can either be a positive part of that or not. I also love that Ashley created an entirely new fandom & universe, meanwhile, she uses tons of other well known fandoms and incorporates those aspects into the story too, because we geeks don’t just love one fandom…we love many. I also really have to hand it to the romance…it was adorable. It isn’t the kind of kiss to end a universe of possibilities. It’s the exact opposite. It’s the kind of kiss that creates them. CJ: I love the bright spotlight on fandoms and cons and bringing people together. And food trucks! Who doesn’t love food trucks (which moonlight as the pumpkin in this story 😉 ). The quote below summarizes what I love about the story. We might all be different—we may ship different things or be in different fandoms—but if I learned anything from twenty-three days in a too blue uniform playing a character I thought I could never be, it’s that when we become those characters, pieces of ourselves light up like glow sticks in the night. They shine. We shine. Together. Ok, we can’t escape this convo without talking about fandoms. If Geekerella was set in your favorite fandom, what would that look like? K: Well I am a big big big nerd. I am really into Star Wars, Battlestar Galactica, and Game of Thrones to name a few. Since most of those are very similar to the universe Ashley created in Geekerella, especially the rebooting of Star Wars for a new generation, I am going to go with my newest obsession, and that is a book universe of A Court of Thorns and Roses by Sarah J. Maas. The cosplay is easy…masquerade balls and Calanmai & Starfall are perfect settings to recreate at a con or ball. The prince is the High Lord of the Night Court, Feyre is clearly Cinderella and even has some cruel sisters to boot. The evil stepmother is probably, Ianthe, and the fairy godmother is the maybe the Suriel! CJ: Everyone knows I’m an avid member of the SPNFamily. We already have our own cons and cosplay contests so it would definitely include that. 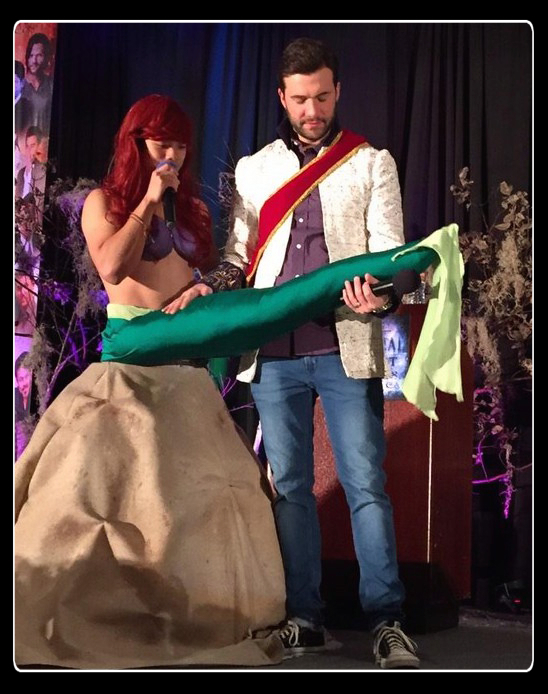 Our resident prince charming is actually Prince Eric (Gil McKinney also plays Prince Eric on OUAT) and he and another character graced a con I was at in cosplay. Our pumpkin is an Impala named Baby. The Evil Stepmother is actually Lucifer. There was once a fairy tale episode of Supernatural.